Though Hubble has seen such "red and dead" galaxies in the early universe, one has never been conclusively found nearby. Where the early galaxies are so distant, they are just red dots in Hubble deep-sky images. NGC 1277 offers a unique opportunity to see one up close and personal. "We can explore such original galaxies in full detail and probe the conditions of the early universe," said Ignacio Trujillo, of the Instituto de Astrofisica de Canarias at the University of La Laguna, Spain. The researchers learned that the relic galaxy has twice as many stars as our Milky Way, but physically it is as small as one quarter the size of our galaxy. Essentially, NGC 1277 is in a state of "arrested development." Perhaps like all galaxies it started out as a compact object but failed to accrete more material to grow in size to form a magnificent pinwheel-shaped galaxy. Approximately one in 1,000 massive galaxies is expected to be a relic (or oddball) galaxy, like NGC 1277, researchers say. They were not surprised to find it, but simply consider that it was in the right place at the right time to evolve – or rather not evolve – the way it did. The telltale sign of the galaxy's state lies in the ancient globular clusters of stars that swarm around it. Massive galaxies tend to have both metal-poor (appearing blue) and metal-rich (appearing red) globular clusters. The red clusters are believed to form as the galaxy forms, while the blue clusters are later brought in as smaller satellites are swallowed by the central galaxy. However, NGC 1277 is almost entirely lacking in blue globular clusters. "I've been studying globular clusters in galaxies for a long time, and this is the first time I've ever seen this," said Michael Beasley, also of the Instituto de Astrofisica de Canarias. The red clusters are the strongest evidence that the galaxy went out of the star- making business long ago. However, the lack of blue clusters suggests that NGC 1277 never grew further by gobbling up surrounding galaxies. It's a markedly different environment for NGC 1277. The galaxy lives near the center of the Perseus cluster of over 1,000 galaxies, located 240 million light-years away. But NGC 1277 is moving so fast through the cluster, at 2 million miles per hour, that it cannot merge with other galaxies to collect stars or pull in gas to fuel star formation. In addition, near the galaxy cluster center, intergalactic gas is so hot it cannot cool to condense and form stars. The team started looking for "arrested development" galaxies in the Sloan Digital Sky Survey and found 50 candidate massive compact galaxies. 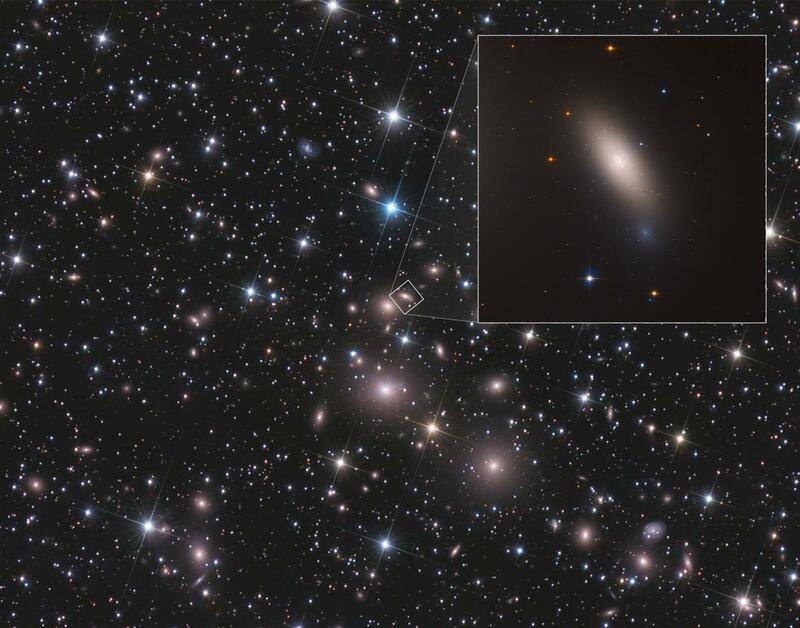 Using a similar technique, but out of a different sample, NGC 1277 was identified as unique in that it has a central black hole that is much more massive than it should be for a galaxy of that size. This reinforces the scenario that the supermassive black hole and dense hub of the galaxy grew simultaneously, but the galaxy's stellar population stopped growing and expanding because it was starved of outside material. "I didn't believe the ancient galaxy hypothesis initially, but finally I was surprised because it's not that common to find what you predict in astronomy," Beasley added. "Typically, the universe always comes up with more surprises that you can think about." The team has 10 other candidate galaxies to look at with varying degrees of "arrested development."